filling up of 40 Vacancies for its various schemes and sub schemes under National Handicrafts Development Programme. 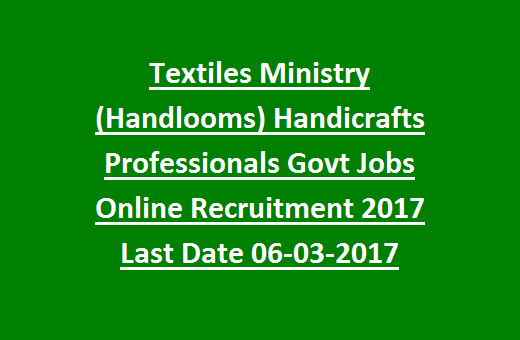 This Textiles Ministry Handicrafts Professionals Jobs Recruitment 2017 is purely on temporary basis and on contractual basis for a period of six months. Interested candidates may visit Official Website of http://handicrafts.nic.in/ and apply Online for Handicrafts Professionals Vacancies Recruitment on or before due date of 06th March, 2017. The Selection Process of Professionals (Handicrafts) will be mainly depended on Educational Qualification, Experience, computer skill test/ written test followed by personal Interview only. 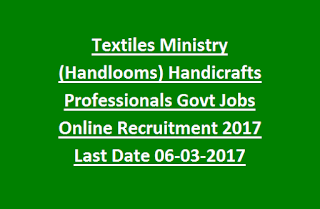 All details of Textiles Ministry Handicrafts Professionals Govt Jobs Online Recruitment mentioned below. 1. Candidates may apply Online for above Vacancies on or before due date of 06th March, 2017. 2. Issue of Admit Card will be notified soon. 3. Tentative Written Exam date will be updated soon. As per Recruitment, total Available Handicrafts Professionals Vacancies are 40. These are purely on contractual basis initially for a period of six months only. 2. The Qualification of diploma in fine arts (Textiles design/ fashion) of three years duration from a recognized institute/ university with minimum two years of Experience in the field of cottage or Handicrafts or small scale industry. 3. Candidates should possess the knowledge of computer application and should have ability to develop innovative approach. 4. Candidates must have fluency in Hindi and English (spoken and written). Upper age Limit for candidates must not be exceeded 35 years as on the date of publication of this Notification. Selected candidates will get the Pay Scale of Rs.25,000/- per month. The Selection Process of candidates will be mainly depended on Educational Qualification, Experience, computer skill test/ written test followed by personal Interview only. Interested candidates may visit Official Website of http://handicrafts.nic.in/ and apply Online for above Vacancies on or before due date of 06th March, 2017.